Giving up smoking is no easy feat; if you've recently given up, you ought to feel great about your accomplishment. 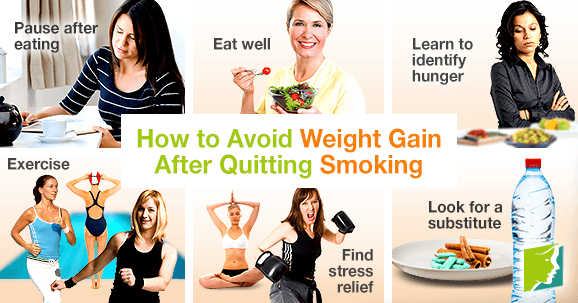 Some women though find that it can be difficult to enjoy the numerous benefits of giving up smoking when they are preoccupied by weight gain. Around 80% of quitters put on weight after cutting out cigarettes, and many fall back into smoking as a response to those extra pounds. This is not an advisable idea for weight loss; a healthy lifestyle and careful habits are all that's needed to deal with weight gain after quitting smoking. The empty, restless feeling associated with nicotine withdrawal is easily confused with hunger. Many recent quitters gain weight as a result of mistakenly using food to satisfy their cravings. Listen to your body closely: are you really hungry? Consider consulting a dietitian to come up with a daily diet plan that will keep you from getting hungry so that you will be able to identify and deal with nicotine cravings rather than eating to smother them. This may sound obvious, but following a healthy, balanced diet with plenty of protein, fiber, whole grains, and fresh fruit and vegetables will go a long way in preventing and addressing weight gain after quitting smoking. Eating complex carbohydrates will promote a feeling of fullness for longer. It takes approximately 15 minutes for the brain to process the feeling of fullness, which makes it tempting to overeat during a meal when the body does not need it. Eat your meal slowly, and take a 15-minute pause after finishing before reaching for seconds. Exercise is not only an effective way of preventing and combating weight gain, but it is also a great distraction from nicotine cravings. Try to incorporate 30 minutes of aerobic exercise, such as running, dancing, or swimming, into your routine, five days a week. The most effective form of exercise is always the one that you will actually do, so choose an activity you enjoy and set realistic goals based on your lifestyle and fitness. Many smokers develop the habit as a response to stress or anxiety, and after quitting use food as an alternative outlet for this. Emotional or comfort eating is not good for your physical well-being or your waistline; find a positive outlet for stress to combat your emotional issues healthily. If the stress relief activity you choose also promotes weight loss (e.g., a kickboxing or yoga class), all the better. After giving up smoking, many quitters miss the hand-to-mouth action of smoking, particularly while socializing, and finger-food snacks - such as chips or candy - can offer an alternative to cigarettes. Find a substitute for this habit that doesn't mean consuming extra calories unnecessarily; sip water or chew on sugar-free gum or cinnamon sticks. While weight gain after quitting smoking is common, it's preventable if you follow these steps to a healthy lifestyle. If you have gained a few extra pounds, don't be too hard on yourself; focus on what you've achieved by giving up smoking: healthy lungs, clearer skin, whiter teeth, and fresh breath - not to mention a longer life expectancy. Resist the urge to reach for the cigarettes: remember, you'd have to be 88 pounds overweight to equal the heart risks posed by smoking 20 cigarettes a day for ten years.